Regine Crespin Interview with Bruce Duffie . . . . . . When thoughts turn to French music and singers of that style, one of the quintessential names that would appear on every list is Régine Crespin. Having mastered her native literature, she went on to receive accolades for other styles and languages. She sang all over the world in a career that spanned forty years on the stage and further seasons as a teacher. Her roles included many of the best-known as well as some more rare, and early on she portrayed a couple of huge characters in settings by “other” composers — Salome in Hérodiade of Massenet, and Brunehild in Sigurd of Reyer! Her late stage assumptions included the title roles in La Grande-Duchesse de Gérolstein by Offenbach and The Medium by Menotti, as well as the Countess in The Queen of Spades. Her American operatic debut was in Chicago, after which she returned in a few seasons and was honored as a Jubilarian during the 50th Anniversary Season of the company. We met in March of 1996, quite late in her career. Her voice, while still strong and vibrant, was decidedly lower than expected. Listening to her speak, one would have thought she had always been a deep contralto rather than a soprano! Her English was delightful — very French and very witty. Several times she used a word and asked if I understood, and always it was either a word we normally use, or one that made complete sense in her context. I have left many of her charming mannerisms in the text, and have only corrected a few instances to make the tenses agree from the beginning to the end of sentences. Here is what was discussed that afternoon . . . . .
Bruce Duffie: After a wonderful career as a singer, you’re now embarking on a new chapter as a teacher, and are currently here at Lyric Opera coaching some of the students in their School [the Ryan Opera Center]. Without mentioning any names, are you pleased with the sounds you hear coming out of the throats of the young people today? BD: Beyond just the vocal equipment, what does it take to make a career? BD: Is it ever good enough? RC: Exactly! That is a big question. And what can I do better tomorrow? But I repeat — patience and work, and again work and work and work and work. And repeat and repeat and repeat. We call that in France une longue patience, a long patience. And also it’s a lot of imagination and curiosity to look around to see what’s going on with singing. Is this bad or good, or very good? What can I get from this one? Can I be inspired by that soprano or that tenor — whoever it is. One needs to be curious, not to live in a secret tower and not get any connection with the world. They should read a lot, go to movies or to musical comedy, to concerts, recitals. BD: To keep the connection with the real world? RC: Absolutely! Otherwise there is a danger. You want to become an artiste — not only a singer, but an artiste, which is a little different. If you become a diva or a divo, there is a little danger to be easily separated from the rest of the world because the fans, the public, put you there. They put you on a kind of pedestal where you are above everybody, and it’s very easy to take that too seriously. So we should be careful of that feeling. RC: No, it is not! But it is not only that; there are many things which are important when we’re singing. It’s our life, it’s our job, but yet we shouldn’t lose the contact with other people, with real life, with the world because it invades you. This job takes all the strength you have, all your possibilities, your liberties. It is difficult to resist that because you know you have to work. You have to vocalize, you have to learn the part, you have to go to rehearsals in the theater or with a pianist if it is a recital. So you are kept busy all the time. It’s difficult not to become cut off from the rest of the world. We are condemned, in a certain way, to become selfish. We have to be selfish to protect ourselves, but we should be aware that we need the other people. We give a lot to the public, and we are people who will receive, also, a lot of love, a lot of applause, a lot of communication. We bring them some joy, some marvelous moments, but we receive also. What I mean is not to lose that contact. BD: When you or the students are onstage, how much is the art and how much is entertainment? RC: What do you mean, exactly? BD: How much is the serious art, and how much is diversion? Is there a balance between the two in a performance? BD: When you’re onstage with a character, how much is the composer and the librettist, and how much is the artist himself or herself? RC: Oh, you have to put all yourself in the part! Absolutely, you have to give and be completely merged in the part, in the music, in the sound, in the vocal business. But when you get off of the stage, it’s ended. Sometimes it takes you a long time to become again yourself. It’s not so easy when you finish a performance or a recital. For me, it took at least three or four hours; that’s why I didn’t want to go to bed immediately. I wanted to go to a restaurant, to drink a beer or some wine in order to quiet me down and be able to reintegrate the body of Crespin. It’s a little tricky. It might be dangerous sometimes. BD: Was it the same after a song recital as it was after the opera? RC: Absolutely; maybe a little less after a song recital, because you are not just one personage. But if you sing an operatic role, you are that personage for three hours. It amazes you, really; it gets in you. I remember some of my friends, even my husband, said, “My God, I am on the stage with you. I talk with you, and suddenly you’ve past the line, being in front of the public. You are no more there. It’s you, I know it’s you, but it’s not my wife.” It was amazing. I didn’t feel that. But he said it’s something really amazing, how suddenly I disappear. I am still there, but it’s not him. BD: Could he see the line coming back, and it was you again? BD: In a song recital, are these lots of little different operas? RC: Absolutely. It’s a lot of different acts, a lot of little stories which are two or three minutes by a certain composer. If you sing some song by Schumann, by Fauré, by Debussy, you jump to a genre which is light and funny or heavy or dramatic or sad. So it’s a kind of like being a clown in the circus. When they laugh, they jump and they do everything they are to do. We are a little bit like this in recitals. We have to jump from two minutes of a sad story, and then the next one is going to be a light one, a funny one. The Fauré one is going to be French, and then we do one in German or Spanish and even English. So it is a kind of a gymnastic, which is fun to do. I might say it is a challenge, a fantastic challenge. But still, you are alone in a certain way, with the music and the accompanist, but really alone to create a little story, one after another. If you sing Tosca, for instance, you are Tosca all the way through, changing according to what’s happening, but it is still this woman. In recital, it is completely different. But for me, a recital which is well performed, well done, is much more interesting than the opera! For me it was a fascinating world of imagination or creation. You are really alone with the pianist and the music. On the stage in an opera, you have a colleague, orchestra, costume, a wig, make up and so on. You don’t show your real self. In a recital, you have to be more open, more exposed. BD: You are more naked? RC: I say that all the time — we are naked in front of a piano, absolutely. But it’s a challenge. BD: Is program-building for the song recital something that every singer must learn? RC: That is a big thing! You have to know how to build it, to do a program. I saw a recital not so long ago — no names and no place — but this was the most boring recital I saw in my life! All the songs were beautiful, but they were all in the same mood; all the recital was in the same mood. The artist who was singing was a good one, but it was all the same mood all the time! You have to build. The beginning of the recital must be a high point. Then if you sing, for instance, a cycle with seven or eight songs by Schumann or Schubert or Mahler, you have to make some contrast in the choice of the cycle you are going to sing. Then you have to think about the end. The beginning of the second part, since the public have had an intermission and left the hall, you have to take them back and catch them again. And the end of the recital has to be really the highest point. So it’s a little playful to build the recital, to put that here in the second part or in the middle of the second part, to consider that is light and something else is not light. It’s a little like a puzzle. BD: And all the time you have to be careful of the throat! BD: Is there a secret to singing French chansons? RC: [Laughs] No. A secret? No, there is no secret. No, I don’t think so. You have to learn French, a little bit, of course, but we all do that; we sing in it. It’s very common to sing in English and Spanish and in German, in French, in Italian. You have to sing in three languages at least, so it’s not so uncommon. With French, you have to, maybe, have some flair, and listen to the music, listen to the elegance of the phrases. But it’s the same in German. If you sing an Italian cycle it’s the same; if you sing some Spanish songs, you have to get in the — how can I put that? — in the earth of Spain or Italy or France. You understand what I mean? In the roots, which is sometimes not so easy. But it’s interesting. It’s a fabulous search. BD: Coming back to opera for a moment, you were offered all kinds of roles. How did you decide — yes I will sing this role, no I will not sing that role, I will put this role off for many years? RC: In fact, first of all, you don’t decide. It’s your voice who decides. For my part, I would have loved to sing Dalila in Samson et Dalila, but I couldn’t because I didn’t have the voice. I would have loved to sing Lucia, but I couldn’t. That would have required a high coloratura. RC: You have to follow the voice you have, first of all. Then in the repertoire you can sing, you might have a choice. You may decide not to sing this or that. I did some stupid choices sometimes, made a mistake. BD: But you can’t know that, though, until you’ve done it. RC: No. For instance, I refused two or three parts I should have sung — for instance, Don Carlo by Verdi. I should have sung this part and it was Karajan who offered it to me. For two years I said, “No, I don’t want to sing it.” He asked why, and I said, “I don’t think it’s an interesting part. You have to cross the stage with beautiful wigs and costumes and so on, and then to wait until the fourth or fifth act to sing a beautiful aria.” He said, “You’re crazy, Crespin, you’re crazy,” and he didn’t talk to me for two years. He was upset, and he was right — I was crazy! But I thought it was not a part where I can show my qualities, so I felt it was not for me. Another role I should have sung was Isolde. BD: Did you never even sing the Liebestod? RC: Yes, I sang that in concert, but never the entire part. But I have a good answer to that. Leonie Rysanek never sang Isolde, and she said, “I prefer that people say, ‘what a pity she didn’t sing it,’ instead of saying, ‘what a pity she did sing it.’” So I take that answer for me, too. RC: Yes, Sieglinde, Elsa, Elizabeth in Tannhäuser, Senta, Kundry. BD: Did Wagner write well for the voice? RC: Not bad. Not so bad. The orchestras are too loud, sometimes. But we have to remember, and Karajan was saying that very often, to sing Wagner like an Italian part. And in fact when he wrote those characters, what we call now the Wagnerian style or the Wagnerian voice didn’t exist at that time. Who was singing Wagner? The ones who were singing bel canto things! So Karajan was very, very insisting that we should sing all the Wagner parts almost like an Italian legato sound. And he is right. Kundry is a little bit special because she has a little crazy moment. [Both laugh] But for the rest of the parts, no, it shouldn’t be too difficult — if you have the voice to do it, of course! You need a rather loud voice, but if you have the voice, you shouldn’t shout, you shouldn’t push. No, I don’t think it is so difficult. BD: Did you change your technique at all for a small house or a big house? RC: No, never. Why? No, no. The technique is the same. I remember when I did my debut here in Chicago — oh, wow! This hall is really enormous! But no, I don’t change. I never had the idea to change something if it was a little hall or a big one, if the acoustic is good. The acoustic is rather difficult here, if I remember... not difficult, but this hall is loud, big, and not round. BD: It goes straight out, straight back. BD: Even if you did not sing differently for big houses and small houses, did you sing differently for the microphone? RC: Good question. First of all, I hated microphones! I wrote a book about my life and it has a chapter on microphones. [Laughs] It is a funny one. For me, it was really a nightmare to record because I was lacking the public. And you know, when you do a recording, you repeat; you do so many “takes”, and then you go to listen, you correct, then you go back, and so on and so on. So it becomes a little bit too mechanical for my taste and for my reaction. After a while, I was lacking my spontaneity, my enthusiasm. I was lacking the reaction of a public. So finally I invited some friends, and said, “Just sit there and I will sing for you, and if you are happy, okay.” But if that was not possible, if I was alone, I was imagining that somebody was there, somebody I loved very much — my husband or a friend — and I was singing for him or for her. I need that impression, that I was singing for somebody! But yet, you know, all the singers are complaining about pirate recordings. We shouldn’t, because I have heard many pirate recitals and operas, and I really saw there how it was spontaneous, more interesting in the interpretation, more alive than a recording made in the studio. Absolutely there is a big difference — for me at least. BD: In the recording studio, do they try to get it technically perfect? BD: I have been told that often the first take is the best. RC: Very often! But to go back to your question, I didn’t like very much to record. I didn’t enjoy it, completely. For a long time, I didn’t want to listen to my recordings. When I would listen, I heard only the bad things, and I was upset — you should not have done that, you should have done it again! It took me some years to be able to listen to my recordings. But once in a while, if I listen to one of my recordings, once in a while I say, “Well, it’s not so bad, finally.” But it’s difficult. In a way, it is like if it is not me. I am judging or feeling some things, almost like it is somebody else. BD: Because it’s finally so far removed? BD: Of the various operatic roles you sang, is there one that is perhaps too close to the real Régine Crespin? RC: Oh, oh! That is a question! Not really. I’m thinking... No, I wouldn’t say that. I wouldn’t say I was preferring this one, or I lived this one better than this one. But close to one, not really. Maybe, maybe, maybe, maybe, the Marschallin, but no, I think I am completely different. BD: I assume, though, that there is something of you in each role you sang? RC: Of course, yes. That’s certainly true. In fact, if you ever are able to say that you were good in a role, it means that really it was showing you more than another one, that it worked some connection with you and your own self. RC: Yes, absolutely! Sometimes it’s a nightmare! Sometimes it’s cruel, but it’s fun. Yes, it’s great fun, a great pleasure. We know that and we should never forget that. BD: Let me ask one last easy question. 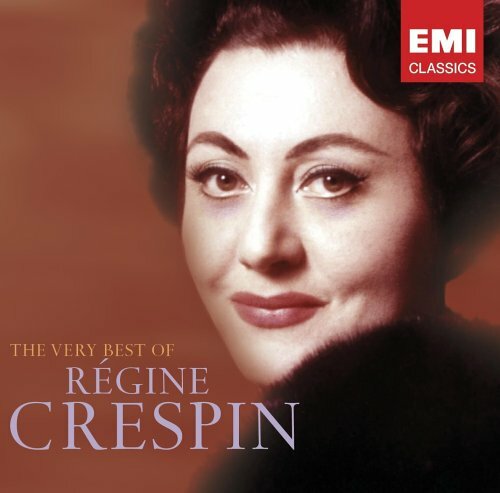 July 6, 2007 - Regine Crespin, one of France's greatest opera singers died Wednesday in Paris. She was 80 years old. Crespin was born in Marseilles and came to singing late, at age 16, a result of not passing the entrance exams for college. 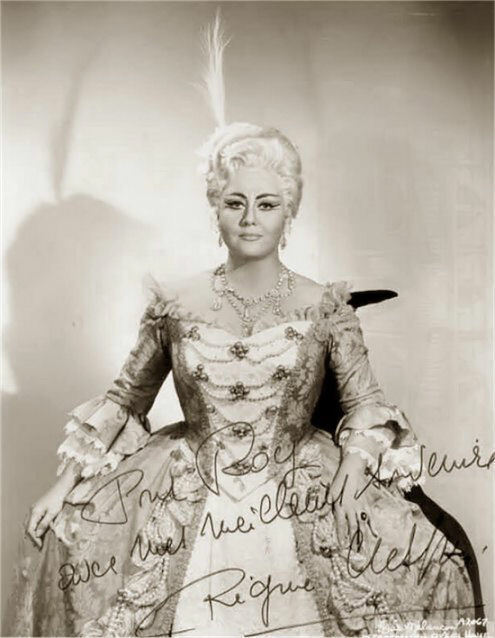 She made her opera debut in 1948 in Reims in the role of Charlotte in Massenet's Werther, and began to make a name for herself singing in other regional opera houses in France. Crespin's breakthrough came in Bayreuth, the German town which hosts the annual Wagner festival in the opera house built by the composer. When she sang for Wagner's grandson Wieland, who ran the festival, she had to perform Wagner's music in French as she had not learned the original German. She was hired, quickly got a German vocal coach, and made her Bayreuth debut in 1958 in the pivotal role of Kundry in Wagner's Parsifal. As her international career expanded Crespin began to make records. 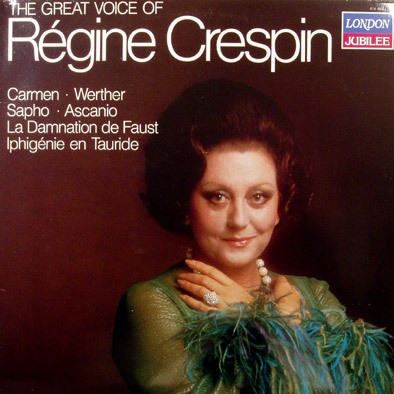 Critic John Steane has written eloquently about Crespin, calling her "one of the great singers on record." But, he points out, not everyone will be immediately drawn to her voice. "Her singing is an acquired taste that becomes addictive," he writes. "The voice itself (strong as it is, and beautiful at a pianissimo) is unlikely to register as particularly rich or pure or even as original." Among the records regarded as her best is the 1963 recording of the song cycle Les Nuits D'ete by Hector Berlioz. Steane focuses on the song "L'Absence," particularly the opening word "Reviens." Steane appreciates the care Crespin takes with that single repeated word, like a call out to a lover. "We feel the voice going out into the distance," he writes. "The first 'reviens' is shaded down to make the echo; the last syllable grows as a call sent out into a valley." 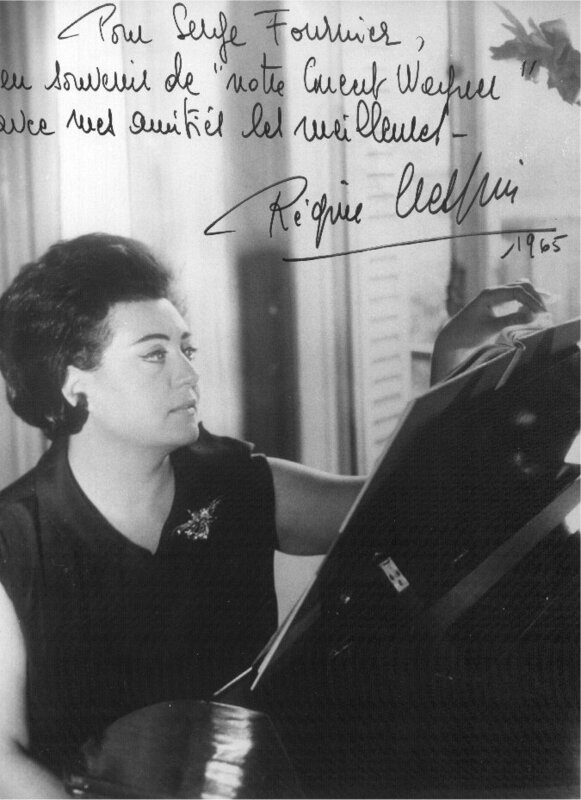 Crespin had many triumphs in her career, including singing the role of the Marschallin in Richard Strauss's Der Rosenkavalier both on record—with conductor George Solti—and on stage. 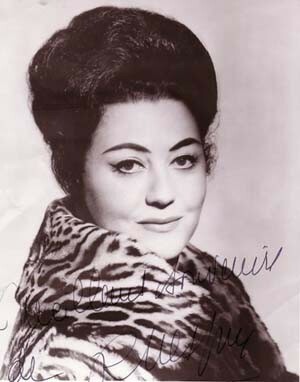 She also won rave reviews for her collaborations with soprano Birgit Nilsson, especially her portrayal of Sieglinde to Nilsson's Brunhilde in Wagner's Die Walküre at the Metropolitan Opera in New York. In her later years Crespin was an effective voice teacher, giving master classes at Mannes College of Music, in New York. This interview was recorded at the Opera House in Chicago on March 29, 1996. Portions (along with recordings) were used on WNIB two days later, and again in 1997. A portion was also included in the group of Jubilarians posted on the website of Lyric Opera of Chicago to celebrate their 50th Anniversary. This transcription was made and posted on this website in 2010.